Dental implants can be used to replace single teeth or permanently anchor a full mouth denture. Each and every treatment that we perform is focused on the specific needs and anatomical concerns of our patients. Plus, with affordable implants starting as low as $2,600 for single teeth, and $6,950 for hybrid dentures, there’s no need to travel out of town or overseas for your dental work. 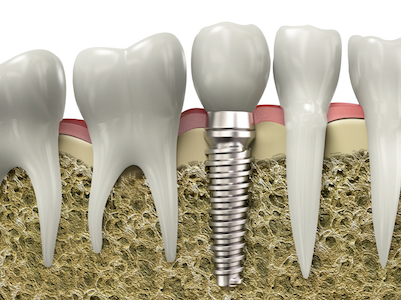 Implants are the gold standard of care for modern tooth replacement. Each prosthetic tooth root is anchored directly into your jaw, the same way a natural tooth would be. When a tooth is lost or removed, bone loss will occur within the first year causing width and height loss. Implants cause physiological bone stimulation to prevent bone loss. Made of biocompatible, hospital-grade titanium, your body then develops new bone around the implant (osseointegration) to permanently fix it in place. When your mouth is kept healthy, implants can last for the rest of your life. Are you a good candidate for our Partial Extraction Therapy? Depending on the number of teeth that you have missing, your implants will support a customizable restoration to replace the crown portion (above the gumline) of your missing teeth. Implants are extremely durable, and as few as 2 to 4 of them can be used to secure a full mouth denture. Multiple Tooth Implant Bridges – to prevent the need for a removable partial denture. Removable Hybrid Dentures – that will replace all of your missing teeth at one time. Our hybrid dentures start as low as $6,950. We also utilize a variety of implant designs – including traditional variations and mini implants. Even if you’ve been told that you can’t get implants without a sinus lift – we can help! One of the things that make our dental implants so affordable, is that we walk you through filing your own insurance claim. On average, many of our patients experience very little to no out of pocket costs whatsoever for their implant treatments! If you don’t have insurance – that’s no problem. We have the best implant prices, as well as convenient CareCredit 0% interest financing. Thanks to technology like our in-house CT scanner and years of experience in implant therapy, we can help you enjoy new teeth in as quickly as one day, to more complex cases in as short as 8 weeks. We’ll start with a preliminary exam, diagnostic casts and x-rays to assess your specific needs. Plus, we utilize diagnostic wax-up models so that you know exactly what your new smile will look like before we ever anchor it into place! Included provisional prosthetics mean you’ll never have to go without missing teeth or endure unnecessary embarrassment. Our Largo implant dental office features a certified prosthodontist who specializes in full mouth reconstruction. As an Associate Fellow of the American Academy of Implant Dentistry and Diplomate of the American Board of Oral Implantology, there is truly no implant case too complex for us to address! Schedule your new patient appointment with us today for just $59. 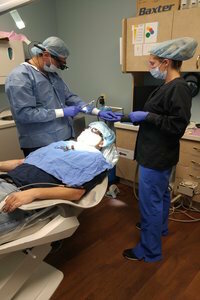 Price includes diagnostic x-rays, exam, and a healthy smile cleaning.